We are all very familiar with these words of Job. Job is a person who knows Yahweh God. "Yahweh" is repeated 3 times in this verse alone. 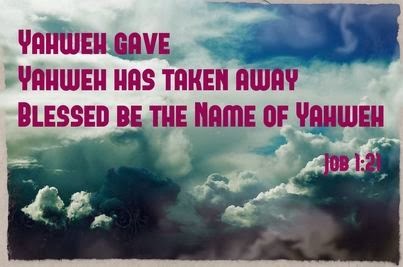 "Yahweh" gave. "Yahweh" has taken away. Blessed be the Name of "Yahweh". Notice that Job blesses the Name of Yahweh in the midst of adversity. In grief, Job's thoughts are on God's Name, and that the Name of Yahweh be praised. We know how to praise God in times of joy and celebration. But do we know how to praise God in times of sorrow and suffering? When we suffer deep pain through difficult trials, the natural response would be anger, complaint and self-pity. We feel that praise is not suitable in such a circumstance. Our thoughts and minds dwell on our sufferings and not on Yahweh God. Remember, God alone is worthy of praise all the time. Why? The only change is our circumstances. As in the case of Job, his situation was completely changed overnight and he lost almost everything. Job has every reason to be bitter and licking his wounds. Job has our total sympathy. In our church, we have been studying the Book of Job in the last 3 months. We want to understand the the suffering of a righteous man. In our suffering, we need to perceive God’s work from beginning to end. Without God, all suffering is in vain. Job is actually under severe spiritual attacks. What is his secret to come through triumphantly in his despondency and intense suffering? He held on to God and he blessed the Name of Yahweh. Praising Yahweh is one of the keys to victory, to overcome Satan's attacks. Satan uses all kinds of attacks to stop God's children to praise God and to curse Him. Job's wife fell into this trap. There are times when the spiritual oppression is so heavy that words become feeble in our prayers. Calling on Yahweh's Name and praising Him will help us soar above our suffering. Don't think that we only praise in good times. Learn to praise all the more in times of deep suffering. Tears maybe flowing out in pain but when our hearts are filled with praise to Yahweh's Name, we find strength in His Name to overcome intense pain and sorrows. Many spiritual battles are lost because of a lack of praise to God's Name. This is why it is very important for you to get to know God's Name, to call upon His Name, and to bless and praise the Name of Yahweh.